Topline. n. (tøp–laɪn) 1. A place of excellence. 2. A position denoting the best. 3. Top choices. 4. A line under which everything else exists. 5. Top of the line. 6. Top stuff. 7. A line of absolute Top Bananas. Topline is a new music production catalogue. Topline offers new and exciting music tracks, songs, themes, underscores and atmospheric moods for every audio and visual application. Topline is your first and only music search. 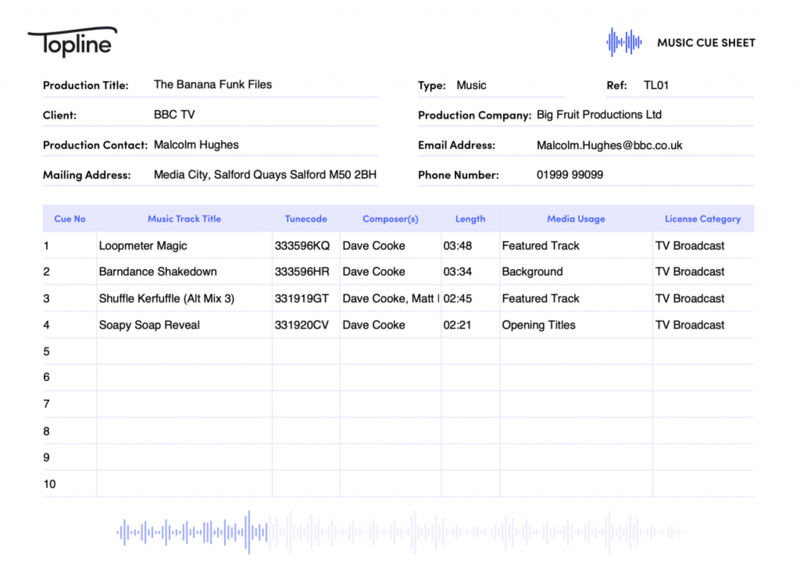 Topline allows you to license the music directly, with a few easy clicks, depending on your specific usage. Topline is the concept of Dave Cooke, music composer, producer, songwriter and generally good chap. The concept is simple; To provide music for any and all occasions. Topline is dedicated to offering producers, editors, sound supervisors, sync managers and anyone looking for that extra special audio flavour, the best music that works immediately and effectively. In the unlikely event that you can’t find what you’re looking for, we offer a bespoke service and a commission based personal service so you get exactly what you want. Topline is great value and easy to use. Licensing any of Topline’s catalogue is straight forward and uncomplicated. Topline offers clear choices using the categories of Moods, Genres, Styles, Instruments, Productions and Colours enabling a very fast and effective music search. Topline seeks to help, develop and encourage new music composers, writers and producers wishing to establish themselves and make a living writing music. Topline is not a publisher. We want primarily to showcase media composers, writers and musicians. We want to have a transparent, clear and direct route from creatives to clients. We want to ensure the creative contributors we work with are at the centre of all we do and that they, as the creatives, receive the lion’s share of the royalties. Topline provides composers and writers a simple, affordable, effective and powerful tool to showcase and licence their works. Topline offers music tracks with alternative mixes based around the original mix. In most cases the additional mixes stand in their own place offering different and additional moods. We can provide stems if required but we decided that in order to make the choices easier we would offer mixes that we feel are useful and have a reason for being in their own right. All the important details about each track are there including key, tempo, code and writer. Choosing a track is easy using the clear and extensive use of categories on the home page. Select and add the tracks to your favourites. In the United Kingdom, licensing music with Topline is handled directly using the purchase page. If you require tracks for overseas use, please contact us for the best rates available. Create an account with Topline Music. Search the website for the music you wish to use. Apply for a music licence using the choices provided at the purchase stage. Download the pieces of music to your computer. If you are based outside the UK get in touch directly for licencing rates. Each piece of music, no matter how long, must be registered separately. If in doubt about the type of licence you require, please contact Topline directly. If you have a Blanket Agreement to license production music, then please get in touch so we can discuss this and the specific usage you require. Andy Bodkin worked at CCLI (Christian Copyright Licensing International) for 18 years. Fifteen of those years were as part of the company’s Global Executive Team. Andy held various roles during his time at CCLI including Licensing Manager, Sales and Marketing Manager, Operations Manager, Managing Director for Europe and Africa and Vice President of Global Operations. In that time, he worked closely with PRS, MCPS, PPL, CLA, MPLC, MPA, STIM (Sweden) and BUMA/STEMRA (Netherlands) gaining a wide exposure to the world of licensing. Andy enjoys taking the complexity out of licensing and making it simple for both the copyright owner and end user to understand. In addition to his business career Andy has also been a Trustee for a number of charitable organisations including Prospects, St Wilfrid’s Hospice, where he was also Chairman and Heathfield and Waldron CFR group as a trustee.